The View Through Your Earpiece: Ohhhh…Anthony Wright is gonna be pissed!! The Patriots record of most wins in the regular season could be in jeopardy. No, unfortunately, Roger Goodell is not considering vacating the AFC Champion's season, but his most recent proposal makes it a little easier to tie and possible to break the regular season win’s record. ESPN’s John “The Professor” Clayton reports that Goodell and the owners are discussing the prospect of eliminating one preseason game and adding one regular season , thus virtually eliminating the already slim chance Anthony Wright had of calling signals for the Giants (in a game) this season. But hey, would a little more Eli and a little less Anthony Wright hurt anyone? The driving force behind the proposal is to raise even more revenue to help the league resolve its current labor disputes. The league believes the most profitable sport on the planet is not making enough money, so why not add another game? Of course, there are some drawbacks. For one thing, regular season football would now start earlier in the year, which means players are hitting with pads and doing more strenuous practices at the height of summer. This is certainly a safety issue for players. (It also starts the beginning of fall waaayyyy before I am ready! Because any God-fearing sports fan, measures their seasons with the sports calendar. I never wear white shoes before the Masters. They’re not in season yet!). It, of course, also throws a monkey wrench into the record books. It gives players and teams one more game to reach single season records and essentially turns a 16 year career into a 17 year career. Finally, it could mean players on the practice squad not getting a fair chance to show their stuff. Perhaps Lawrence Tynes 43 yard field goal in the 4th game of preseason was what got him spot over Josh Huston who had been kicking well. 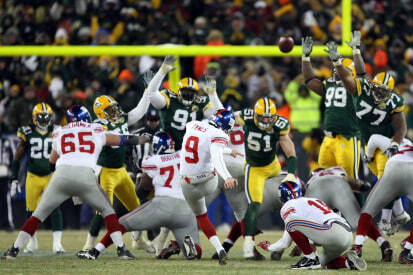 No Tynes, no overtime field goal against the Packers? Still, these obstacles are surmountable. Careful planning and appropriate supervision will enable players to brave the heat. As for expanding the schedule, the NFL has done it before. All of the major sports have done it at least once and fans learn to deal with it. 61* eventually became just plain 61. As for the practice squad, players are promoted all the time during the season. Maybe they just won’t be on the opening day roster. The 17 game schedule is a good thing. It’s one more glorious week of football. One more thing that can go so right or go so wrong. It allows NFL fans to see teams that they may not necessarily see every year. I don’t buy the argument that there is not enough money to go around in the NFL, but if it gets me another weekend of sitting on the couch all day in my boxers eating a meatball hero and watching the games then count me in.